N64 The Legend of Zelda: Ocarina of Time (JPN v1.0) in 22:50.27 by Swordless Link. Although the length of this movie is 22:50.27 when timed with our standard method, applying the timing method used by most Zelda speedrunners (until last hit on Ganon) would result in a final time of 19:46:22. It's important to note this so that there's no confusion about which runs are faster than the others. 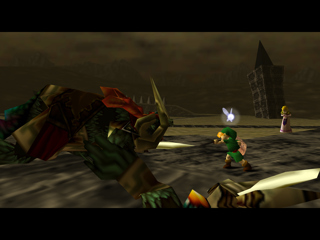 In this TAS of The Legend of Zelda: Ocarina of Time, the author aims to beat the game as quickly as possible, and achieves this by exploiting a large sequence break which involves "tricking" the game into warping Link directly from the Deku Tree (the first dungeon) to Ganon's Castle. It's a large improvement over the previous run and features an entirely new route; one which, for the first time in Ocarina of Time TASing history, doesn't even involve becoming Adult Link. Unlike the previous movie of this category, this TAS was done using the Japanese version of the game. The reason for this is that the text is significantly faster than in the English version, which means that far less time is spent waiting for text boxes and cut scenes to end before getting back to the action. English subtitles were added to the encode for people interested in what is said. The author's notes explain in great detail many of the things done in this TAS, which may be confusing to those who aren't familiar with Ocarina of Time speedrunning. Reading them is strongly advised.